I’ve yet to finish helping the norn and gaining their trust, but Ogden insisted I visit the Battledepths. King Jalis Ironhammer and the other dwarves are waiting for us there until we can amass an army against the destroyers. With such short notice, I was only able to persuade Kudos S. W. to come along with me. Everyone else must have been too busy buying “consumables” or working hard to buy a new set of vanguard or norn armor. Heading west from the Eye of the North, we entered the Battledepths. At first it’s quite dark, and then not too much farther along sunlight beams in. Aside from the underground passage way outside Kaineng City, I have yet to explore the many Depths of Tyria opened up to us. On my first pass through this area to reach Sifhalla, I was surprised at how massive the area seems to be. I wondered if all of these “new lands” contained areas with borders as big as this. For a while I was worried that no other adventurers would want to accompany me in the quest to explore every corner of Drakkar Lake. Luckily my friends Elwin and Xiara felt like taking on a challenge. Right outside the gates of Sifhalla there is a large entrance into a cave system and another path that leads into open wilderness. I decided to revisit the cave before exploring the rest of Drakkar Lake. 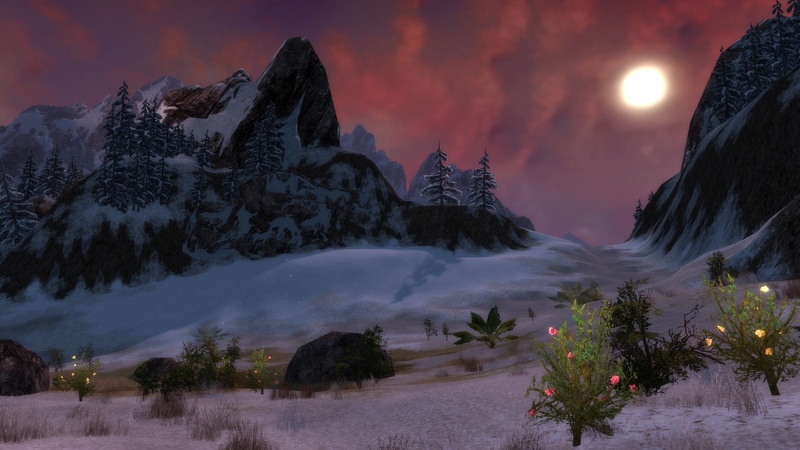 When I entered the Norrhart Domains for the first time, I met Jora, the norn hunter from Boreal Station, on her quest to track down the nornbear. It made sense to help her, since we needed the norn’s help against the Destroyers. Plus I’d rather have the norn as allies than enemies. Our quest took us to Gunnar’s Hold, a massive norn hearthstead (outpost) owned by a famous smith: Gunnar Poundfist. There we were given further advice to seek out Sif Shadowhunter’s help with tracking the nornbear. With a bit more time on my hands, I took the opportunity to explore the Norrhart Domains on the way to Sif Shadowhunter’s hearthstead, otherwise known as Sifhalla. Even though there is much to do (and to buy) in these newly discovered lands, my friend Elwin L. took time out of his day to accompany me into this unforgiving frozen wilderness. After the events of Nightfall, I returned to Cantha and enjoyed a overdue vacation. Of course, evil can only stay quiet for so long. It all started with a series of earthquakes all over Tyria that left large crevasses leading into the uncharted depths of Tyria. There we encountered dwarves. 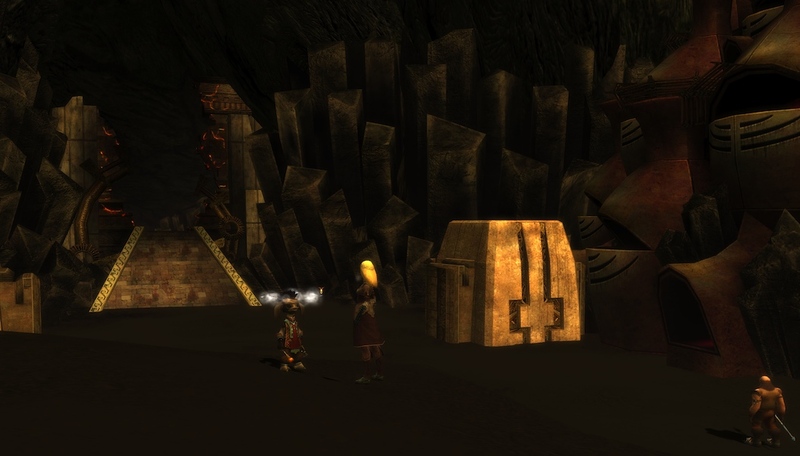 The one who seemed to lead them was Ogden and an asuran named Vekk. We couldn’t chat for long because as we entered the crevasse, we were chased by bloodthirsty beasts that Ogden called “destroyers”. Luckily Vekk took us through an “Asura Gate” and we landed safely in Boreal Station, an outpost in the Far Shiverpeaks far beyond the Northern Wall of Ascalon. To keep the destroyers from following us, Vekk destroyed the Asura Gate in Boreal Station. Here we also met our first norn, Jora. Ogden seemed ready to attack the giant warrior, but she had no intention of fighting us, because there was “bigger prey” to hunt. 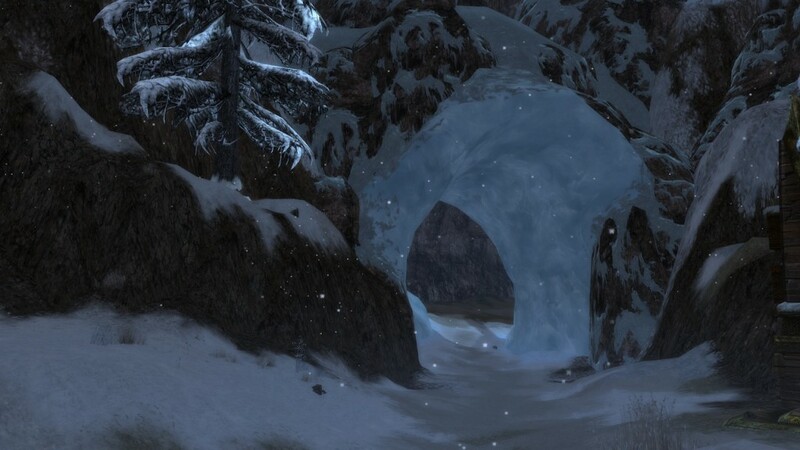 Before she left our sights, we also learned that there were humans living in the Far Shiverpeaks. 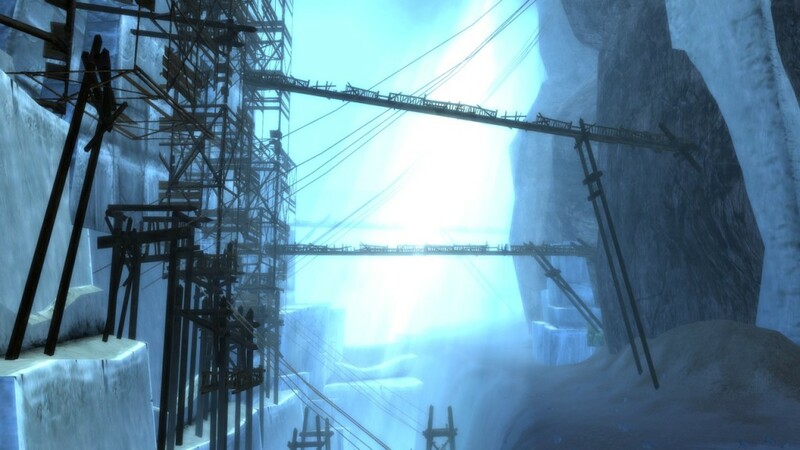 Boreal Station had many adventurers from around Tyra who found themselves here through some of the many crevasses that opened. I spotted my old friend U. Loreal, and a guild member Turiel L. and invited them to join me in exploration of the area outside: Ice Cliff Chasms.